How do you grieve the loss of a loved one? Is it best to seek the comfort of others or go it alone? Stay stoically strong or let it out? Does it take weeks, months, years? Actually, says Dr. Roberta Temes, we all experience and process grief in our own unique way. No one can tell you exactly how you'll feel or what to do, but with Solace as your guide, you'll understand the stages of your grief and your changing and sometimes conflicting emotions. Dr. Temes will help you consider the pros and cons of bereavement groups, counselors, and other sources of help, and how to use visualization and other techniques to ease your mind and heart -- even on your worst days. 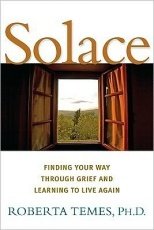 Enriched with personal stories drawn from the author's bereavement practice, Solace also provides inspiring quotes and affirmations to lift you through each day -- until the healing process takes hold and you begin once again to find purpose and joy in life.